The king of climbs and arguably the hardest road in the land, the legendary Hardknott Pass is an amazing sliver of tarmac. First built in 2nd century by the Romans, the pass is unbelievably tough from both directions. To climb from the east, begin at the warning sign at Jubilee Bridge. It’s very steep into a small woodland, over a cattle grid and then you will see the enormity of your task. Enter the first of two sets of brutal switchbacks and wrench body and bike through the 25% corners. What follows is a brief levelling out but you can’t put off what lies ahead for long. The second set of switchbacks are steeper still, and these now 30% slopes will have you straining every sinew as your front wheel desperately searches for a kinder gradient and weaves all over the road fighting to stay upright. If you can ride this, you can ride anything. Just keep going, then head down the terrifying descent. 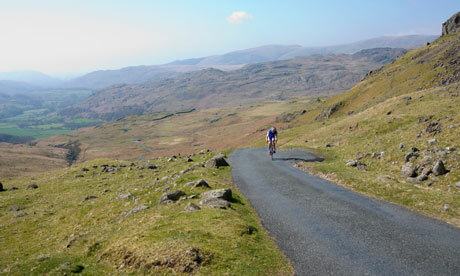 Where To find Hardknott Pass leave the A595 and head east towards Eskdale. Ride over Irton Pike and pass through Eskdale Green and Beckfoot to reach the base of the climb next to the warning sign at Jubilee Bridge. Grid Ref: NY 231 014 (OS96). 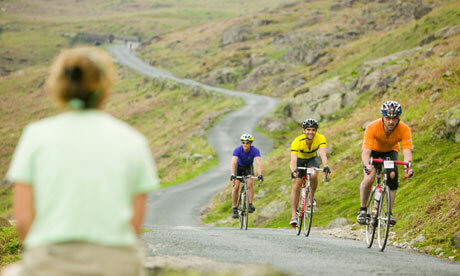 Cyclists on Wrynose Pass in the Lake District. Photograph: Ashley Cooper/AlamyIf Hardknott is the king of climbs, then Wrynose is its queen; slightly softer at the edges but no less ruthless. The hardest ascent is from the west, beginning at Fell Foot Farm, where straight away you have a 20% right-hander and that’s just a taste of what lies ahead. The road levels slightly but the surface is cut up and damaged. Still, that’s the least of your worries as you pass a 25% sign. A long, long stretch of wickedly steep tarmac lies ahead, hugging the side of the mountain, with a slight levelling halfway but steeper still after that. Then you hit the switchbacks, where a better surface is cold comfort as you grapple with gravity’s pull and attempt to hold your momentum through these vicious bends. Once through, you can pick up some speed before the final steep turns and your new-found momentum will help carry you through these and over the top. 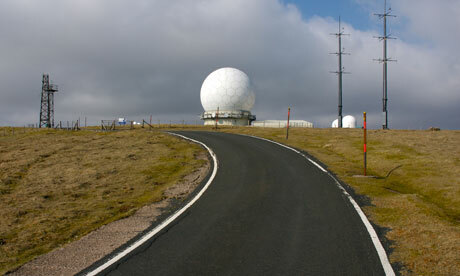 The radar station of top of Great Dun Fell. Photograph: John Morrison/AlamyThis is the greatest climb in England, this is our Mont Ventoux, it has no peers, there is no comparison: Great Dun Fell is simply unique. I’d waited a long time to ride this road, initially put off by its “private” status. I was to discover that there is absolutely no objection to cyclists riding it, although few would be mad enough. Approaching from either direction you see the radar station’s “golf ball” glowing like a beacon on the top of the ridge. Turn away from the village of Knock and begin opposite a farm gate. The climb is tough right away, then gets tougher still as you bend right into what is a small taste of things to come. Get through this, the first of many brutal stretches, and things back off for a while before ramping up to the first of two gates. Through the gate, straight over a cattle grid and into more hard work, the road bending left past a stone shelter, a sure-fire signal – although you are nowhere near the top yet – that you’re heading into truly hostile country. 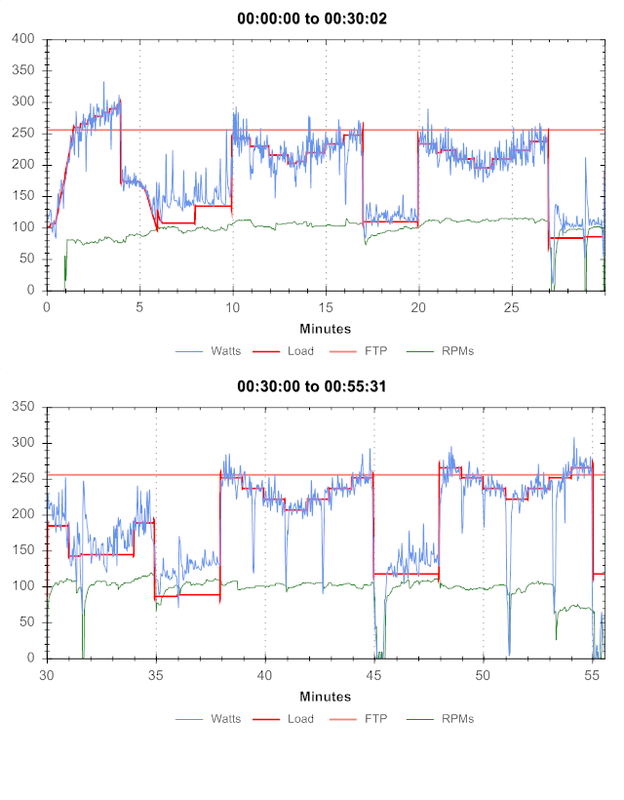 Up and up, and then mercifully dipping, or is it just levelling? Whatever it is, it makes the stretch of climbing ahead look terrifying. Approaching 20%, you crawl through harsh, boulder-littered scenery, a massive slog to the briefest of levels where the classification of the road changes – public cars are allowed no further. Now very narrow and lined with snow poles, the climb is so well surfaced it resembles a two-metre-wide carpet. And it’s so steep, close to 25% at the point where the tall valley walls disappear and the radar slowly rises over the horizon to sit above you, tracking the remainder of your progress. Through a second gate it’s easy for a while then bending right once again it’s leg-breakingly tough to the finish at the station, where, looking around you, you might as well be on top of the world. 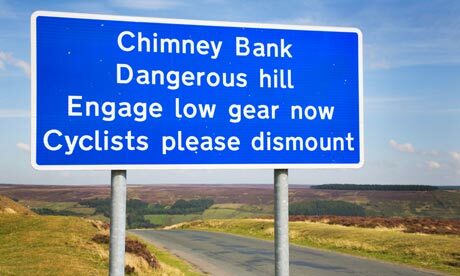 Warning sign near the Rosedale Chimney in North Yorkshire Photograph: Mark Sunderland/AlamyFew climbs have such a fearsome reputation as Rosedale Chimney, and rightly so. I snapped my chain not once but twice in my attempt to conquer this vicious stretch of tarmac. Leaving Rosedale Abbey, a sign warns you of the one-in-three – yes, one-in-three – gradient to come. This climb isn’t for the faint-hearted. The surface is rough at first and steep from the outset, but improves as you pass over a cattlegrid and approach the double hairpin. The second bend here is so steep on the inside that it forces you far right, so take care. Now straightening up, the next stretch is ridiculously hard, the main problem here being just staying upright while either side of the road, sheep wait to see if yet another rider falls victim to the Chimney. Stick with it, as eventually the one-in-three does turn into a relatively gentle one-in-six, allowing you to build a little momentum to drag your bike up on to the moor. Fleet Moss, the highest road in Yorkshire, is a beast from either direction but the greater challenge lies in the route south from Hawes. Through Gayle, the road flat, hugging the river, soon rises sharply for a short 17% lung-opener. It then all but levels off as you pass various farm buildings, where the surface is broken and covered with the mud and debris from passing tractor tyres. After a few slight rises the road surface improves dramatically and stretches far into the distance, taking the shortest route over the featureless ridge. Populated by wandering sheep, the road steepens relentlessly, offering nowhere to hide as you click through the gears hoping to find a large enough sprocket just to keep moving. You are eventually rewarded with a blissful flat stretch, but it’s not over yet; round a left-hand bend is yet more 20% gradient, a final zig-zag and a few last kicks take you to what feels like the top of the world. On the eastern edge of the Long Mynd lies the infamous Asterton Bank, also known by many other names that I could not print here. Without being too hysterical, this climb is nothing more than a joyless straight line of pain. Start opposite the old red telephone box, past the numerous warning signs, across the cattle grid then bend slightly left. You’re now face to face with the vicious 25% corner which delivers you on to the cruel slopes that cling to the side of the sheer bank. The surface, just wide enough for a single car, is smooth at the edges but little more than gravel and moss in the centre. It never relents, never lets up until you reach the bend in the shadow of a rocky outcrop, you’ve still got a fair bit of climbing to reach the top, but it’s not as hard now. You will, however, be able to reacquaint your backside with the saddle for the final push to summit on the approach to the gliding club. You’re spoilt for choice when it comes to climbing Cleeve Hill. The three vicious ascents leaving Woodmancote all offer a fantastic challenge, and of the three it’s Bushcombe Lane that stands apart. From the junction with Station Road, exit the village past the first 25% sign then the road bends left at a second 25% warning – as if you need reminding, it’s going to be hard. Once the gradient kicks in it just gets steeper and steeper, 20% past the last of the houses, then the fun really starts. Banking right, the surface breaks up and 20% soon turns into 25%. This is one of the toughest bits of road anywhere in the UK and, through the next left-hand bend, it touches 30% at the apex. Heave yourself round this evil corner and you’re through the worst of it. There is still some way to go but you can click through the gears before finishing just after a gaping cattle grid adjacent to a small car park. Named Hellfire Pass by the English but better known by its Welsh name, Bwlch-y-Groes is the highest tarmacked pass in Wales. Climbing into the Aran Mountains on the edge of Snowdonia, its a road of outstanding beauty – rough, weathered and remorselessly steep. 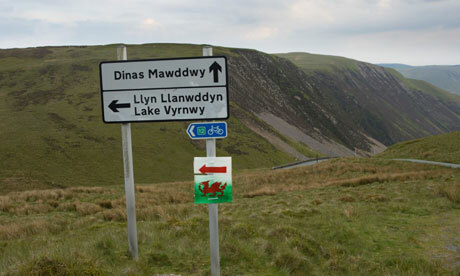 Leave the A470 at Dinas Mawddwy and head into the Afon Dyfi Valley. Once past an axle weight sign the climb begins. Passing farm buildings and trees, the road veers left, then a very sharp 25% right – a taste of what’s to come before easing as the last of the trees disappear beneath you. Now round to the right, the ever steepening, increasingly lumpy surface heads into arguably the hardest section of relentlessly steep tarmac in Britain. The sheer length of this steep section is what sets this climb apart, there’s just nowhere to recover. You’ll be counting each and every pedal rev as you slowly push your way up the scree-littered road to the summit. The road from Cockbridge to Tomintoul, Aberdeenshire. 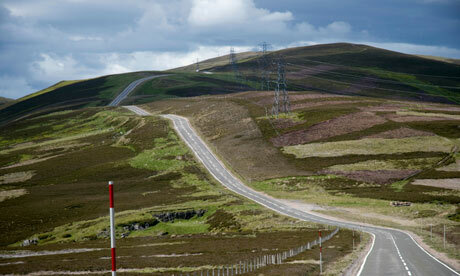 Photograph: Paul White/AlamyA true monster of a climb through the heart of the Cairngorms, the road up to the Lecht Ski Centre is a simply stunning ride. You start your ascent from the beautiful Corgarff castle and straight away you hit 20% slopes – rough, relentlessly steep and twisting a little. Pass through the large orange gates used to close the road in winter – proof, if you hadn’t twigged already, that you’re heading into serious country. After an age on the opening steep gradient the road banks right to plateau before a brief downhill. What comes next will take your breath away. There, in front of you, painted on to the side of the mountain and looking like a giant flight of stairs, lies the rest of the climb. A short flat section ramps up hard, then almost levels before ramping hard again. Eventually you’ll bend around to the left and the battered, rugged road levels for good. In front of you is the Alpine-style Ski Centre, a simply awesome ride. Scotch mist hanging over Bealach na Ba. Photograph: Stephen Dorey/AlamyThis is it: the Holy Grail, the toughest and wildest climb in Britain. Anything you have read or been told about this amazing road is likely to be true. Believe the hype. 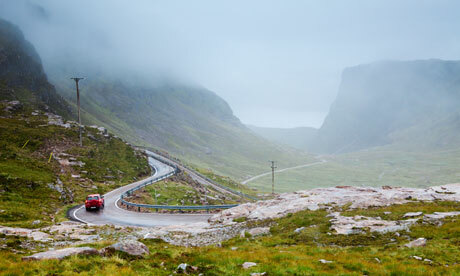 The majority of Scotland’s roads stick to valleys as there’s no need to cross the mountains but here they link the village of Applecross with the rest of the world by taking the route over the top of Bealach-na-Ba. It is an incredible climb both ways but the road from Tornapress, heading north-west, is just awesome. Do not attempt to ride here in unfavourable conditions. Check the forecast before you head out and be prepared for harsher weather at the top. Leave the head of Loch Kishorn, turn left and you’re on your way, soon passing the large sign warning of the various dangers that lie ahead. It’s not too steep to begin with but as the road bends hard left at the base of an almighty tower of rock, then the gradient increases. Now climbing steeply, this slither of rough road clinging precariously to the mountainside bends hard right to deliver you into a true wilderness. Apart from the few cars that travel this route, you’re more likely to have wary, onlooking deer for company, as they track your slow progress up the mountain. Up ahead, eventually the final bends come into view, just as the gradient gets brutal on the long weather-beaten 20% slope that tests your legs to the limit. After all that has preceded it, the finale – a set of four hairpin bends – may be all too much, but fear not. The road levels between the sharp bends giving you a chance to attack each wicked corner then gather yourself in time for the next. Zig-zag past cascading waterfalls, amidst the brief protection of rocky outcrops to exit this tangle of tarmac and round one final left hand to finish.